I think this is one of my favorite outfits to date! This white t-shirt from Cuyana is so soft and so well made. And I am totally obsessed with this floral blazer from Windsor Store. The colors are perfect and it will go with so much. I just can't get enough floral in my life! On another note I am so bummed! I am supposed to be headed to Dallas today for a big blogger conference that I got invited to in January. Emily was actually here visiting me and we both got the invite and were so excited. So we immediately started planning our trip! I have never been to Dallas so I was so excited. But then I found out I needed surgery in Februaruy, which pushed back everything with IVF to April. So here I am. Because of IVF I am not able to go to Dallas today. I know it was the right decision not to go because my main focus right now is IVF. But I am still a little sad. But hey everything happens for a reason and God has a plan. I will miss getting to meet all of my fellow blogger friends but I hope it will all be worth it in the end! Also the Tory Burch friends and family sale starts today! Use the code FRIENDLY to get 25% off your purchase. Here are some things I have had my eye on and now that they are on sale It is the perfect time to get them. Thank you so much fro reading. I hope you all are having a great week. OMG i love that blazer i totally need one like that because i dont own anything floral besides blouses and 2 pairs of jeans! LOVE that blazer! Looks so great with that clutch and those heels! Good luck with your surgery Jade, praying for you! 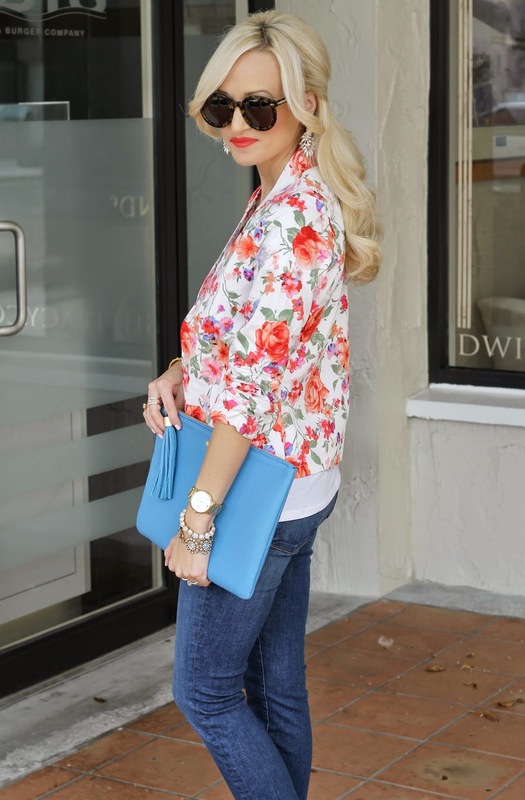 I absolutely love this floral blazer. I've been searching for one for months & this one is by far the prettiest I've seen! I don't know if anyone on this planet has more perfect style than you do, my dear. Absolutely stunning! You nail it every day. Such a cute look!! I got invited to go & wasn't able to due to an event that I had been planning for work :( It occurs on Saturday, so no rScon for me either! There's always next year! That blazer is so perfect with those heels! I love all the florals have been posting lately!! What a fun and gorgeous look, Jade! I was looking forward to seeing your adventures on Insta and give you recommendations on what to do while you were here, but you are so right. God is in control. This is what He wants for you and I know that you trust in Him. P.S. I love your recommendations! I nabbed that double zip bag last week and it's even more gorgeous in person! Red, but also a pink! SO pretty! This look is to die for! I love the floral blazer and the bright shoes. The studded cuff helps make it the perfect look! Oh what a bummer! I'm sorry for you.. but you are so right! God does have a plan and I'm sure He will totally redeem this situation.. Lovely look! I'm so loving your heels!!! I love the blazer, and love those shoes!! You always do a fabulous job with mixing and complimenting colors! Love that blazer and those shoes! Looking fab as always! 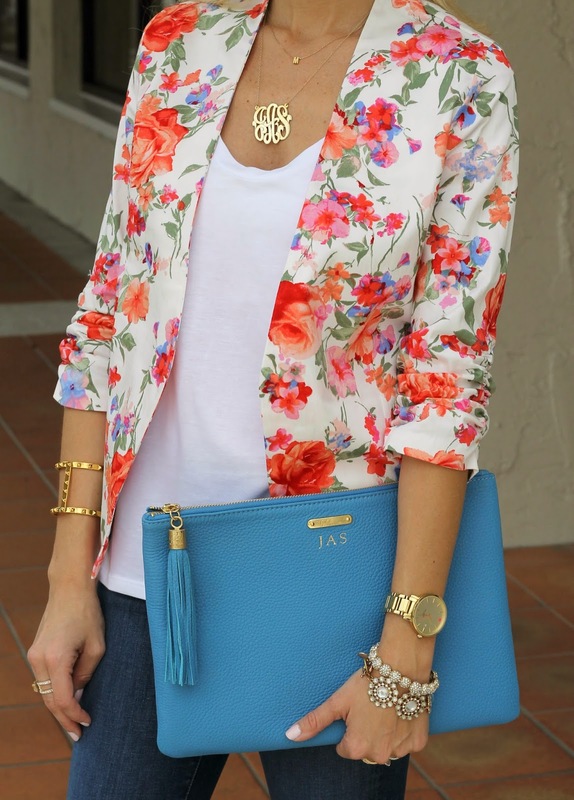 What an adorable floral blazer! Those jeans are so practical! You can definitely dress them up and down easily! Love your Gigi New York clutch! wow this is such a gorgeous outfit!! you look great!! !